January | 2013 | We Can't Hear the Mime! 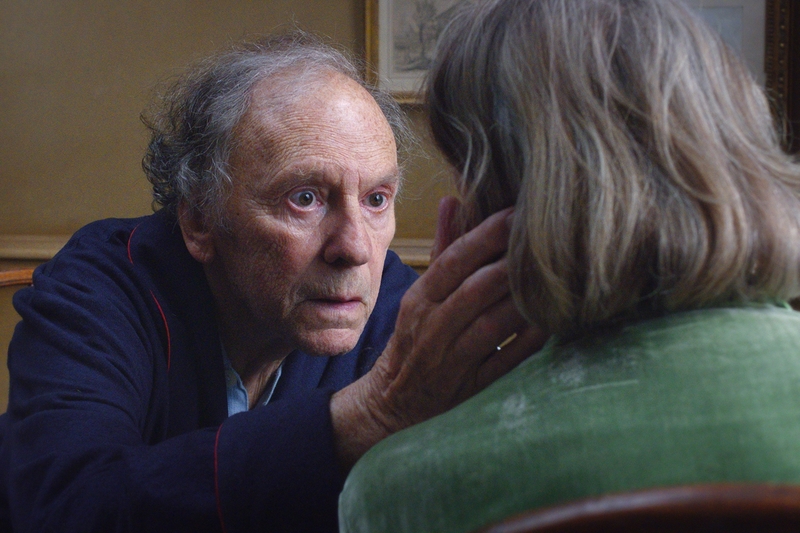 Haneke certainly has the gift for making his audience feel uncomfortable. Last time it was the terrifyingly creepy small town antics in The White Ribbon which caused this discomfort. In his most recent film (winner of the Palme d’Or and nominated for best film at the upcoming Oscars) it is simply the intrusive and frank view of the slow journey away from life. A harrowing film and not, in the traditional sense, ‘enjoyable’ but certainly an artwork. Claustrophobic cinematography adds to the sense of inevitability and being trapped as, to my recollection, the camera leaves the small apartment only twice in the two hour film. It is a testament also to the script that such a barren setting and a cast of essentially three people can create such a moving portrait of love and loss. The film is almost documentary in style, thanks in no small part to the use of sound. Music is minimal and mainly diegetic. The credits play over complete silence and the sound of breathing is often heard in the film as a cruel, hopeless reminder of the inevitable end. The performances from both the leads so genuine and sympathetic that it becomes difficult to remember that you are not watching a real-life account. This realism only adds to the film’s success. In Short: Be prepared for an immense artwork, if you can see it through your own tears. This entry was posted in European Screen, Film Reviews, Gold Screen and tagged Amour, Emmanuelle Riva, Film Review, Jean-Louis Trintignant, Michael Haneke, Oscars on January 30, 2013 by Flo. Can we just take a moment to look at the Django Unchained tagline? I think this pretty much sums up everything that is wrong with this film. Had it just been “The D is silent.” It would have been a funny, cool and sophisticated tagline, however the addition of the second half ruins what the first half is trying to say and turns something delicate and intelligent into a meaningless bloodbath. There’s something good trying to get out here, but it just gets drowned in blood and guns. This entry was posted in Screen 8 and tagged Christopher Waltz, Django Unchained, Jamie Foxx, Leonardo DiCaprio, Quentin Tarantino on January 27, 2013 by Flo. There is a moment about twenty minutes into Les Misérables as the music swells and the camera follows the torn parole papers of Jean Valjean into the sky. At this point you either decide to enter wholeheartedly into the spectacle or find yourself condemned to three hours of boredom. I myself, chose the former. Tom Hooper has indeed taken on a challenge in adapting the very popular stage show. The film would never be able to reach the absolute hard-core lovers of the musical as too many songs are truncated, edited or cut entirely, not to mention the addition of a new song which destroys the established musical patterning of the whole. Yet these changes are what make this an excellent piece of cinema. What is not immediately useful or engaging is scrapped, and where the show leaps awkwardly over eight years, leaving the audience to fill in the gaps, the original song, although perhaps crudely, fills the void in time and place. The performances vary somewhat. Although the acting is solid throughout some of the singing performances are a little lacklustre. Hugh Jackman’s vocals take on a nasal tone somewhere in the first half and never lose it from there on out. This unfortunately made “Bring Him Home” the low point of the film as a soft, quiet prayer is sung loudly and brashly in the streets of Paris. At this point of bizarre melodrama and cinematography, sung through broken windows, it is hard to keep sight of the earlier scenes such as Anne Hathaway’s gut-wrenching rendition of “I Dreamed a Dream”; a mesmerising scene which takes a hackneyed song and makes you forget you have ever heard it before. Hathaway’s raw emotion transcends the lyrics. Russell Crowe’s Javert is stiff but by no means two dimensional as others have claimed. In fact his stiffness seems perversely to give the character more depth as the moral rigour of the law has imbued itself into his style of walking, talking, thinking and singing. The visual elements of the film cannot be faulted, from the extreme close-ups to the sweeping shots over revolutionary Paris the film never ceases to add excitement to what is often a dully-staged musical. “One Day More”, a chorus scene where all too often characters simply walk on stage at their line and stand there has become, through the camera lens, a dynamic intersection of every life the story touches as it cuts between every hopeful face and action. In fact, throughout the film the camera adds a new dimension to the songs as the multitude of scenes that essentially involve men standing around singing at one another are given visual interest through facial expressions and camera angles impossible on a stage. In short; the film breathes a new lease of life into the musical, thoroughly entertaining and relentlessly true in spirit to the original. This entry was posted in Film Reviews and tagged Amanda Seyfried, Anne Hathaway, Film Review, Hugh Jackman, Les Misérables, Russell Crowe, Tom Hooper on January 27, 2013 by Flo. Last year I saw Lars Von Trier’s Melancholia. While I cannot deny that it held some great performances and certainly some beautiful cinematography I found the film as a whole far too self-involved and slow to be truly engaging – it definitely slipped off the edge of enjoyable. However at that time somebody recommended to me Another Earth as “the lower budget but better version of Melancholia”. Intrigued, I finally found a copy of this film one year later. Certainly the premise is similar. A planet slowly approaches earth, getting bigger and bigger in the sky and causing not a small amount of scientific curiosity and widespread panic. (Both films share a flagrant disregard of gravity and the knock on effects upon the earth’s orbit, which would most likely kill everyone on earth before our protagonists could even eat their morning bacon.) However this is where the similarities end. 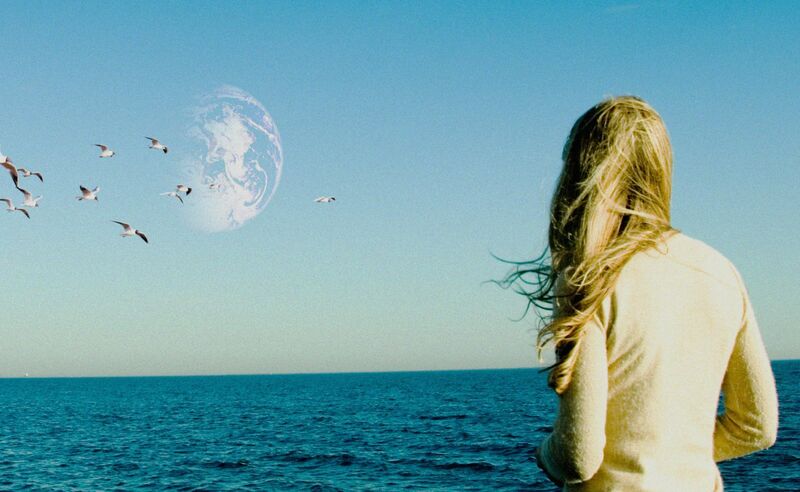 What we have in Another Earth is a gem of the Indie-Sci-Fi-Psychological-Drama genre. While the cosmic events are a key plot device, the story is one of human nature and kindness beautifully realized by director and co-writer Mike Cahill. Leading actress and co-writer of this spectacle, Brit Marling brings Rhoda, our protagonist, to life with grace and sensitivity when the character could so easily have become whiny, unsympathetic and, in places, abhorrent. The bold soundtrack (provided by Fall On Your Sword) lends pace to the slow, thoughtful film; the humming techno music becomes a reflection of the rising tensions between characters. The delicate naturalism of light and angle in the cinematography is counterbalanced by this electronic heartbeat underscoring the film. All in all a pleasure to watch, elegant and sophisticated but with a lot more substance than you’d first expect. This entry was posted in Film Reviews and tagged Another Earth, Brit Marling, Film Review, Mike Cahill on January 25, 2013 by Flo.